30% of Hank's blood comes from this legendary horse. 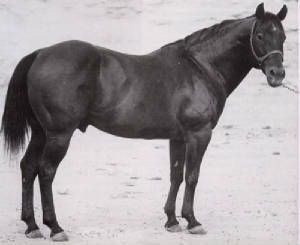 Craig, being a voracious researcher by nature, looked up information about King and found out some VERY INTERESTING DETAILS about the legendary stallion. When Jess Hankins (King's final owner, who owned King for most of the stallion's life) took a foal crop to a sale, he was asked how he was able to train the foals to be so well-behaved. Hankins replied, "I don't train them that way. That's how they're born. It's in the breeding." King horses have a reputation for being extremely people-oriented horses, and often won't really 'behave' until they know the one handling them cares about them. King horses respond best to people with whom they've established a relationship with. This may sound odd, but we have seen this first hand with our dealings with Hank and his get and it's amazing how linked in the horses can get when you give them attention, consistent training, and praise. King horses, because they're so smart, have a tendancy to get bored easily, so their trainers need to keep them busy. Along with that, King horses usually want a 'reason' for doing what they're doing, and honestly do respond well to being told why they're being trained in a certain way and what the outcome should be. King horses often have full, curly manes and tails. King horses often have fuller necks than other horses, along with the strong bone and large rumps typical of foundation bred Quarter Horses. To honor Hankins, King's final owner, you'll often see the name 'Hank' (as in JJ Kings Hank) in King horses' names.